When Ain’t An Anaconda An Anaconda? Apologies for the use of the awful contraction ‘ain’t’ but the International Standards for Science Communication (ISSC) demand awful alliteration at almost all opportunities. 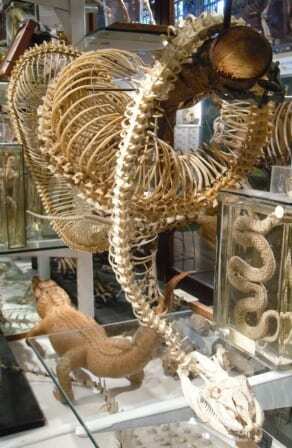 If you are reading this post then it is possible that you know of the Grant Museum and if you’ve visited then you’ve no doubt been impressed by our rather lovely articulated anaconda skeleton pictured here on the left. It’s a beautiful skeleton that grabs the attention and brings to mind questions like “How many ribs?” and “Who had the job of putting together what is surely one of the world’s most difficult jigsaws?”. It’s one of the specimens we list in our top ten objects you must see on a fleeting visit, it features in Kingdom in A Cabinet our guide to the Grant Museum and an image of this specimen was chosen for our postcard selection (available now from the Grant Museum).